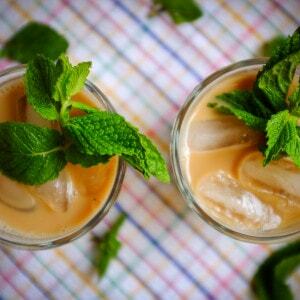 One of my favorite summer indulgences is the Mint Mojito Iced Coffee at Philz. The combination is simple but genius. 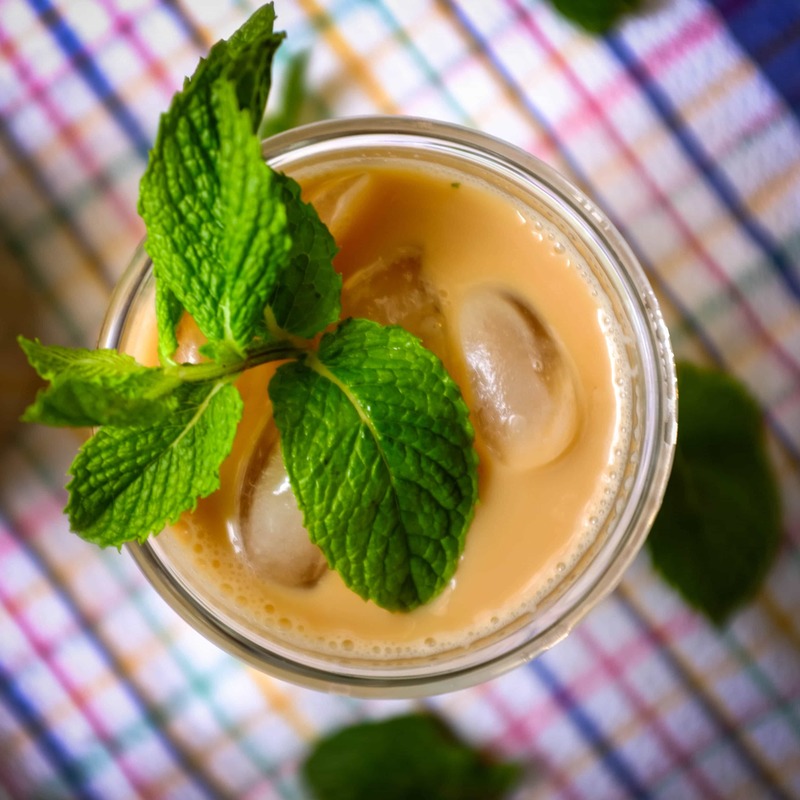 Each frothy cup starts with a handful of muddled mint leaves. Plenty of ice, freshly brewed pour-over coffee, cream and sugar complete the drink. It is creamy and sweet and delicious, perfect for a weekend treat. While I could make you a copycat recipe, I chose to go a lighter route — this recipe makes two servings, each topping out at a cool 95 calories. My version is sweetened with a moderate dose of clover honey instead of spoonfuls of sugar, and I used 1% milk instead of the Philz standard, ultra-rich manufacturing cream. You could also easily sub in agave nectar or brown rice syrup for the honey, and almond milk or soymilk for a vegan version. Divide the ice cubes between two large (16-ounce) glasses. Set aside. Cut the mint leaves into 1/8-inch ribbons, and place in a quart-sized measuring cup, or other bowl or pitcher with pouring spout. Use a cocktail muddler to smash the mint leaves liberally, until uniformly bruised. In whatever vessel you used to brew your coffee (I use a Melitta filter over a large mug) stir in the honey until dissolved. 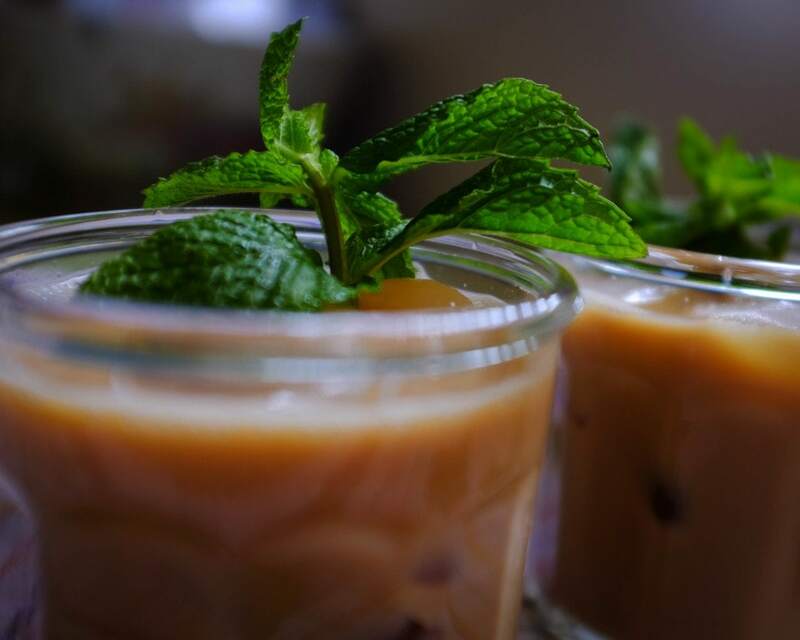 Pour the sweetened coffee and milk into the measuring cup with the muddled mint. Stir for about 10 seconds to infuse the mint into the liquid. Hold a small strainer over one of your serving glasses, and pour the coffee mixture through the strainer and into the glass. Repeat with second glass. 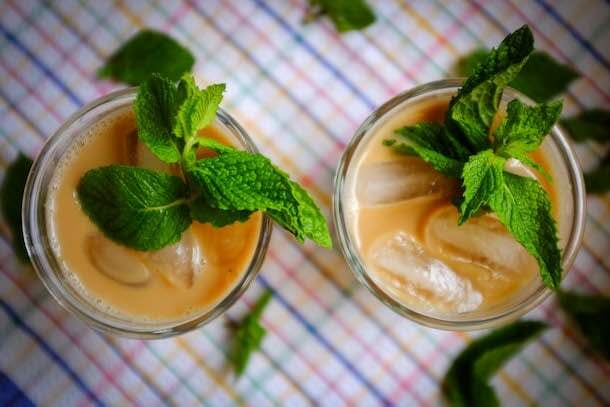 Garnish with mint and serve.